Although it is actually a Mexican holiday, Cinco de Mayo (5 May) is equally big in the United States, especially in those states near to the border or with a large Mexican population. The day commemorates Mexican victory over the French in the battle of Puebla in 1862. Throughout various cities across the United States there are many celebrations in bars, pubs, cantinas and restaurants, much like St. Patrick's Day in March however with more tequila and less green beer. 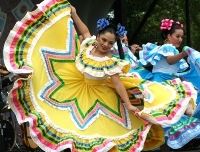 In cities with stronger Mexican populations there may be numerous festivals and traditional dancing.